After the founding of the Turkish Republic of Northern Cyprus in 1974 the country for some time used the flag of Turkey. On March 9, 1984 the country released its own flag, which is in use till this day. Flag of Northern Cyprus is used usually alongside the Turkish flag as symbol of devotion and the inseparability of the two states, despite the fact that the flag of Turkey has no actual status of the TRNC. This resembles the situation on the southern side of the island, in the Republic of Cyprus, where the Greek flag is also widely represented, along with the official flag of the country. 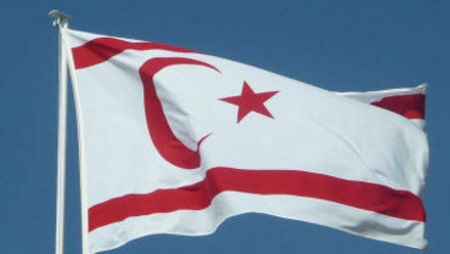 Flag of Northern Cyprus is very similar to the flag of Turkey: the white color was replaced by the red, and red by the white, and two red strips were added, however, the half moon and star have stayed the same. Cypriots love their symbolism: flags of Northern Cyprus and Turkey can be seen everywhere - in government buildings, on top of the mountain ranges, on the balconies of apartment buildings in major cities - Famagusta, Kyrenia or Güzelyurt, as well as in small towns, such as Bogaz . The village center is located on a mountain hill rising above the coastline, and at the very highest point proudly located two inseparable flags - Turkish and Northern Cypriot. As an essential reminder of the kinship between the two countries, the flags of Turkey and Northern Cyprus are laid over the hillside Pentadaktylos, which is part of the mountain range "Five Fingers". Dimensions of the flag of the TRNC is 500 meters long and 225 wide, and at night the flag is illuminated by more than 400 lamps. The famous signature under the Turkish flag, "Happy is he who can call himself a Turk" belong to the first president of Turkey, Mustafa Kemal Ataturk. The flags visible from almost any high point in Nicosia. This giant symbolism is considered the largest in the world and notes the existence of Turkish Republic of Northern Cyprus and its inseparability from Turkey. Some interpret this as a monument to the violent summer of 1974 for it is a reminder of the massacre of 87 Turkish Cypriot residents of a small village located in the north east of Limassol. Those who were able to stay alive took refuge in the settlement of Tashkent, which is near the erected flags. Dimensions of the flags are so impressive that they are visible to passengers of planes landing in Nicosia. Today, when the peace talks on the reunification of the island entered a new round, the theme of the new Cypriot flag is becoming more urgent. If the Cyprus problem will be resolved in favor of the reunification of Cyprus, the question of the new flag of the country is sure to appear on the agenda. During the attempted reunification of the island in 25004 based on the Annan plan, a new national flag of a united Cyprus was introduced. The flag contained red and blue colours, symbolizing the colours of Turkey and Greece. In 2003, this flag was chosen from 200 other options put forward in the competition, sponsored by the United Nations, as the best sample, indicating the union of a divided Cyprus along ethnic lines. Now that the negotiations on the reunification of the country took a new turn and gave new hope to the residents of both North and South Cyprus, remembering that very flag that has not been accepted by the two parties, becomes particularly important.